Yet again as we go to press, the immediate future of the plans for Britain leaving the EU remains unclear. Three attempts at passing May’s Withdrawal Agreement couldn’t resolve it. Two rounds of MPs voting on alternative proposals couldn’t resolve it. Seven and a half hours of cabinet meetings on 2 April couldn’t resolve it. It’s hard to believe that in the next few days either Yvette Cooper’s attempt to extend Article 50 or any attempt from May to bring back her proposal for a fourth round will be any different. This absurdity reveals the complete paralysis of parliament as a result of the crisis facing the entire capitalist establishment and system. It looks increasingly likely that either Britain will leave with no deal on 12 April or Theresa May will be forced to call a general election. There is a huge burden of responsibility on Jeremy Corbyn and the workers’ movement to fight to ensure it is the latter. A second chance for MPs to ‘take control of Brexit’ through a series of indicative votes was another dismal failure on 1 April, continuing the deadlock just eleven days before the (already extended) deadline to leave the EU with no deal if nothing can be agreed. The usual outraged chaos ensued. Those MPs supporting the option of remaining in a permanent customs union with the EU (the closest vote, losing by a margin of three) publicly condemned those campaigning for a second referendum for not supporting the proposal as a fall-back option. The farcical atmosphere was emphasised by 20 minutes of the 1 April debate during which the bare buttocks of Extinction Rebellion climate change protesters faced the chamber from the public gallery, where they had glued their hands to the glass. Interviewed afterwards, several of the activists highlighted that, while MPs have spent months failing to find any way forward over Brexit, the vital issue of climate change and the future of the planet – which has spurred tens of thousands of young people to walk out of schools and colleges on strike this year – is wilfully ignored. The same could be repeated on dozens of issues that continue to blight the lives of workers and young people. While politicians snipe and manoeuvre with no success, outside the Westminster bubble the effects of austerity, poverty and inequality are the daily reality for millions. German Europe minister Michael Roth wasn’t wrong when he – for his own electoral ends – said that 90% of the Tory cabinet have “no idea how workers think, live, work and behave” and that British politicians “born with silver spoons in their mouths, who went to private schools and elite universities” are to blame for impasse but won’t be the ones who suffer the consequences. This is why it is so vital that Jeremy Corbyn and the workers’ movement are clear in linking a way forward for Brexit to the pro-worker policies of jobs, homes and services for all. This is even more important as the prospect of an ‘accidental’ no-deal Brexit grows. The bosses and the Tories would inevitably try to use the chaos of such a scenario to attack workers, and Corbyn and the trade union movement must act to prevent this. That means demanding the opening of the books of big businesses that claim cuts and closures are necessary because of Brexit arrangements, and, where necessary, fighting for their nationalisation under democratic workers’ control and management. The voice and potential power of the working class must be brought to bear on all contingency plans and emergency measures. This can answer workers’ anxieties about what Brexit will mean for them, and cut across the far right’s attempts to use the issue to divide working-class people along the lines of race and nationality. The workers’ Brexit that Corbyn has called for previously has never been more needed to cut through the inability of the pro-capitalist politicians to move forward. The best way for Corbyn and the trade unions to seize control of the situation is to boldly fight for a general election. This should be done inside parliament, but also outside, calling mass rallies and demonstrations and convening trade union-led meetings to organise the fightback in every area. The Tories recognise the danger for them in this path – senior figures in the party allegedly warned May that they would risk annihilation against Corbyn in an election. One special advisor was quoted as saying that considering this option “is nailed on mad. But the mood in number ten is desperate. They are in a bunker and in denial about how bad things are.” The Daily Mirror reports recent polling showing Labour on 41% to the Tories’ 36%. However, this outcome is not guaranteed. Without a clear answer to workers’ fears and questions over Brexit, the Tories can potentially pitch themselves as the defenders of the 2016 referendum decision against a majority of Labour MPs trying to reverse it, or get as close as possible to that. In a snap general election campaign which the Tories would attempt to frame as a referendum on this one issue, it’s not ruled out that such a campaign would be successful. And the Tories would be aided in this by the Blairites, who do not agree with Corbyn’s workers’ Brexit proposals. This again raises the need to take on the Blairites and fight to transform the Labour Party along socialist lines, including immediately triggering the trigger ballot process to give the rank and file a say over who represents the party in elections. He should boldly assert that parliament has yet again proven itself incapable and that the choice of what kind of Brexit people want should be given to ordinary people through a general election. 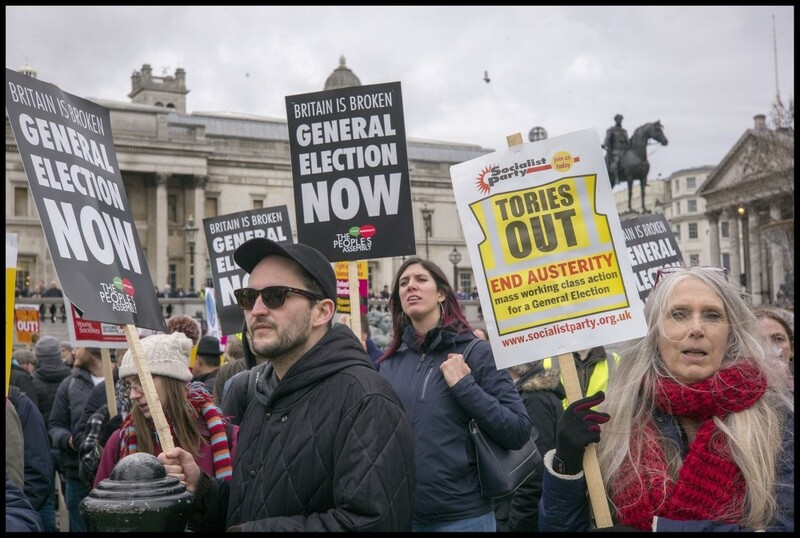 Such an election would need to be fought by Labour on an anti-austerity, socialist manifesto – going further than the 2017 one, which won Labour the biggest swing from one party to another since 1945. Bold calls for an increase in the minimum wage to genuinely reflect the cost of living, scrapping zero-hour contracts, huge investment in the NHS and education, an end to all cuts and privatisation and so on, have the potential to galvanise working-class anger at austerity and sweep Corbyn’s Labour to a decisive victory. Such a manifesto would also need to outline what a workers’ Brexit would look like. As a starting point, that means the immediate repeal of all EU laws that limit workers’ rights or place obstacles in the way of anti-austerity policies. It should be clear that any big company using Brexit to threaten closures or job losses will, where necessary, face nationalisation under democratic workers’ control and management, with compensation paid only on the basis of proven need. Combined with an appeal to workers’ organisations and left parties to fight for the same approach in other countries, this can begin to build the basis for genuine cooperation and solidarity of people across Europe, on a socialist basis, in contrast to the neoliberal EU, which only serves the interests of big business and the capitalist system.